What part of the world are gopher snakes from? 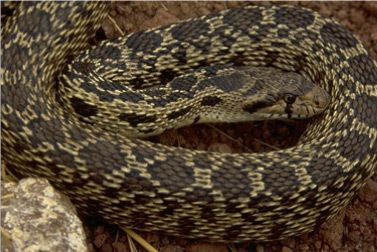 Gopher snakes are one of the most widespread snakes in North America. Their range extends from the Atlantic to Pacific oceans, as far north as southern Canada, and as far south as Veracruz and southern Sinaloa, Mexico, including Baja California. What type of habitat do gopher snakes prefer? Gopher snakes are considered habitat specialist being found in deserts, prairies, woodlands, brushlands, coniferous forests, and even cultivated lands. These biomes can be rocky, sandy, sparsely or heavily vegetated, and range from below sea level to over 9000 feet (2700 m). 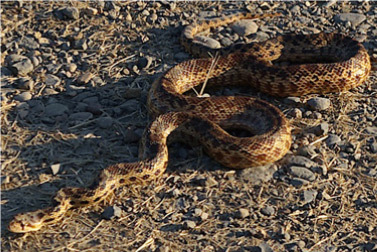 Gopher snakes are constrictors that consume mostly mammals, although birds and their eggs are also eaten. Specifically, gopher snakes will consume mice, moles, gophers, chipmunks, squirrels, birds, small rabbits and eggs in some cases. Occasionally they will enter an animal burrow, consume the inhabitants, and then take possession of the burrow. How does reproduction take place with gopher snakes? 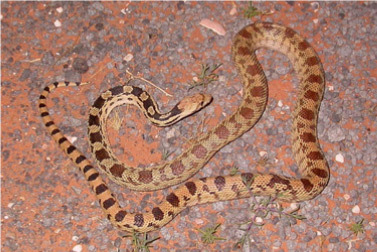 Male gopher snakes engage in ritualistic combats during the spring mating season. The combatants remain on the ground, entwined from tail to neck. Each tries to maintain its head and body position, although occasionally they will exert so much force that they roll. They usually do not bite each other but hiss loudly. Presumably the combat ritual is a means of determining the sexual fitness of a male, for usually only the victor will copulate afterward. Mating occurs in spring or early summer. During the summer months 2 to 24 eggs are laid that hatch in the fall. Emerging young are up to 16 inches long. How do gopher snakes behave? When disturbed, the gopher snake will rise to a striking position, flatten its head into a triangular shape, hiss loudly and shake its tail at the intruder. 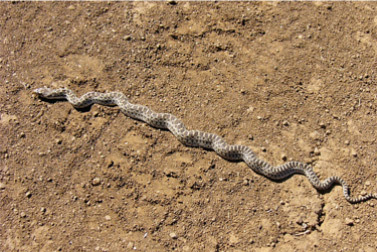 These defensive behaviors, along with its body markings, often cause the gopher snake to be mistaken for a rattlesnake. 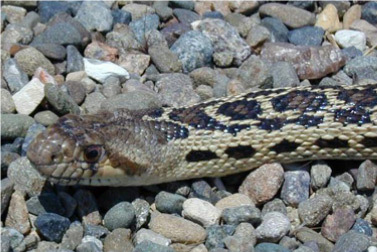 The tapered tail, the absence of a rattle, the lack of a facial pit, and the round pupils all distinguish the gopher snake from the rattlesnake. The gopher snake is active mainly during the day, except in extreme heat when it ventures out at night. It is also a good climber. What is the conservation status of gopher snakes?